It comes as no surprise, but Fiona has become obsessed with Easter eggs. All she has wanted to do this week is decorate eggs while boasting about how the Easter Bunny is going to bring her all sorts of chocolate eggs, gummy eggs, and other egg-related candy. Strangely, I don’t ever remember having a talk about the Easter Bunny, nor all the sweets she’ll apparently soon be consuming. Sounds like Mom must be involved . 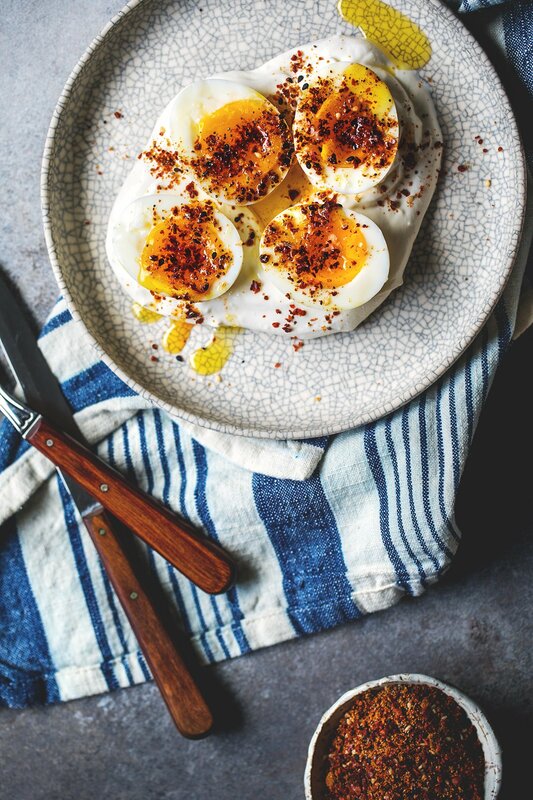 . . needless to say, the girl loves her eggs; whether sweet, or savory like these beauties here! In a pan over medium heat, toast the spices/seeds to be used in the ground spice blend. Once the spices become fragrant, remove from heat. Allow the spices to cool, and then grind to a fine powder using a spice grinder. Set aside. In a pan over medium heat, toast the sesame seeds, poppy seeds and black sesame seeds to be used in the chile mixture. Remove from heat, allow to cool, before adding the Aleppo chile flakes, the paprika, and the ground spice blend. Mix everything together and set aside. Bring a pot of water to a simmer, enough water to cover the eggs. Gently lower the eggs into the water with a spoon to prevent the eggs from cracking. Simmer for 7 minutes. While the water is boiling, fill a bowl with cold water and ice. After 7 minutes, strain and place eggs in the ice bath to cool the eggs down. Add the minced garlic and a large pinch of salt to the labneh and stir to combine. Peel the eggs and cut them in half. 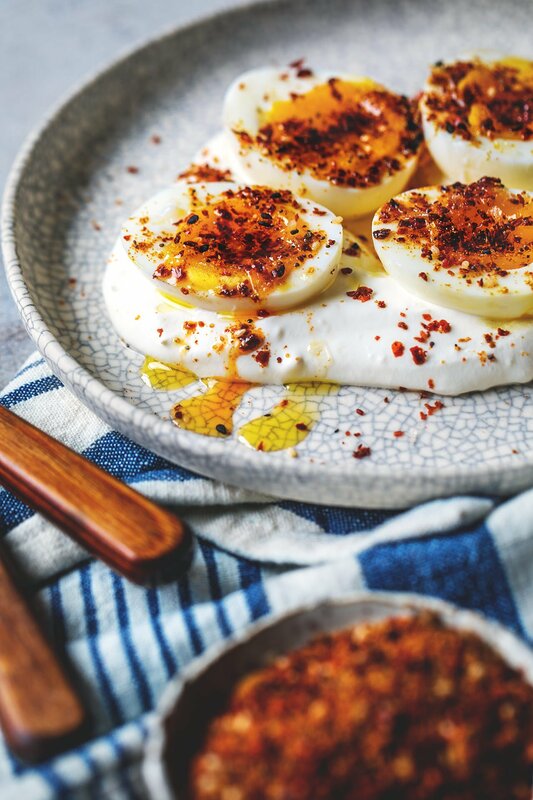 Spread the garlic labneh on a plate and place the eggs on top of the yogurt. 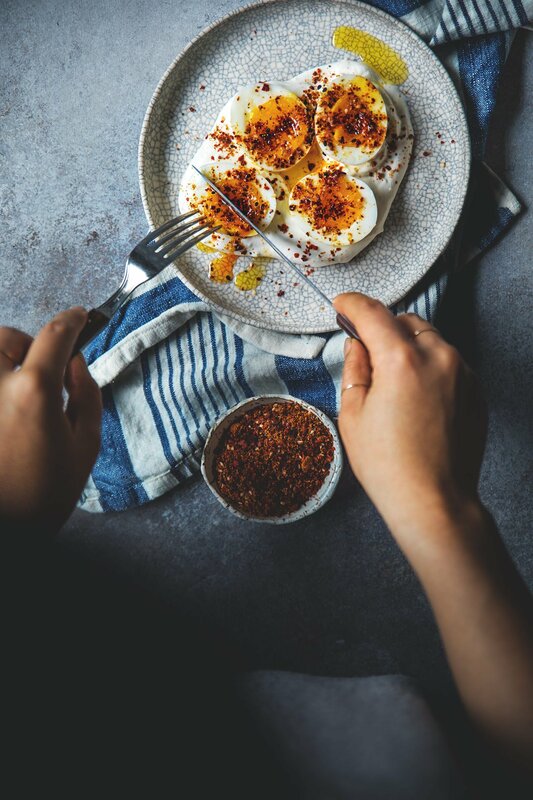 Drizzle the top of the eggs with extra virgin olive oil, top with the chile/spice mixture and a pinch of sea salt. Simple things are always the best 🙂 Beautiful photos ! This combination of flavors is so yummy! I can see why you were inspired by those Deviled eggs. And these photos are so pretty! Pinning! Whoa flavour! 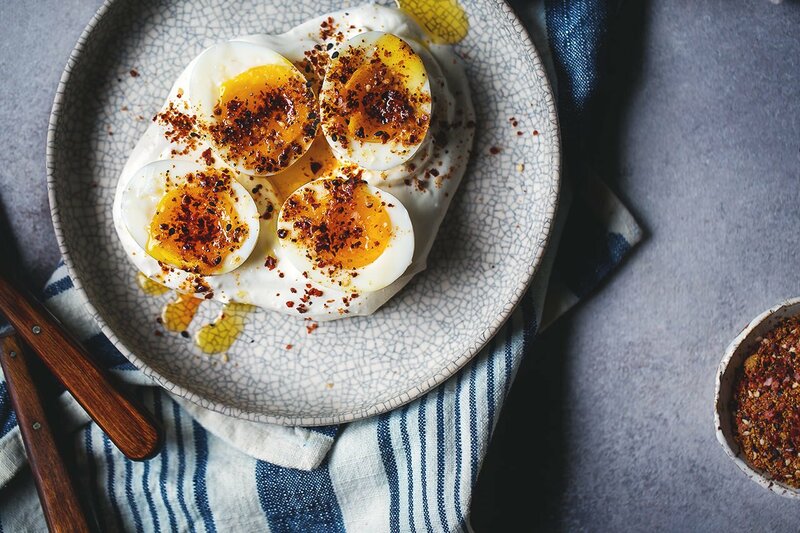 These eggs look amazing! oh my goodness, this looks amazing! I bet having that chile mixture on hand would be amazing in itself!